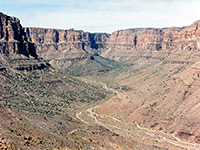 The Hualapai Reservation occupies a large area of the western Grand Canyon corridor, south of the Colorado, from Pearce Ferry at the upper end of Lake Mead, 56 miles due east to the boundary of the smaller Havasupai Reservation. This is rough, rugged land with few facilities and although a lot is rather flat, either open grassy plains or wooded plateaus, towards the north it falls away to a series of deep, branched canyons that in general become more impressive further east. Most of this country can only be visited by lengthy hiking and/or driving on dusty dirt roads, though the Hualapai have developed one tourist center at Grand Canyon West, a small settlement on the rim 3,600 feet above the river, quite close to the Grand Wash Cliffs that mark the edge of the Colorado Plateau and the end of the Grand Canyon. Grand Canyon West has increased in popularity after the opening of the nearby Grand Canyon Skywalk, where visitors can walk along a curved bridge with a glass-bottom walkway projecting 70 feet out over a section of side canyon with near vertical walls, and so look down towards the Colorado River, nearly 4,000 feet below (though the river itself is not directly beneath, but rather about a mile to the west). The Skywalk opened on March 28th 2007 and is just the first component of new developments in this part of the canyon, as subsequent plans include a tramway, a replica Indian village and a luxury resort. Though not all the Hualapai are happy with the commercialization - some see it as a desecration of the land. Many visitors to the attraction are also not too pleased, on learning that the total cost to walk along the skywalk is around $100 per person (2019), and that no photographs may be taken on the bridge, because cameras, together with all other loose personal items must be removed, the official reason being to protect the glass surface should they be dropped. This rule is enforced by security guards and metal detectors. Pictures may be taken of the skywalk from the rim, however, and the Hualapai will photograph guests out on the bridge, for an extra fee. 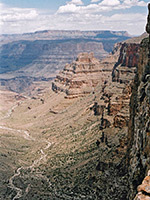 It is worth noting that the canyon is not as deep, wide or spectacular as areas further east which may be visited just by paying the standard $35 national park fee, and that there are other places that offer vertical views directly down to the Colorado river, such as Tuweep (which is free to visit, though reached by a long, rough road). Route 66 provides easy access to the Hualapai Reservation - 16 miles of the stretch between Kingman and Seligman pass through the southern part, including the tribal headquarters town of Peach Springs. There are three main routes further into the rez, as it is known locally; the only paved highway is IR 18 which heads northeast starting 7 miles east of town, and crosses gently sloping, wooded land of the Coconino Plateau. It passes no other villages just various dirt tracks that lead to sites in the eastern half of the reservation, and eventually passes into BLM land then on towards the Havasupai Reservation. The main feature in this section of the Hualapai lands is Prospect Valley, a very long tributary that meets the Colorado in the middle of a former volcanic area of cinder cones and lava flows, just south of the Lava Falls rapids. The second road (IR 6) leaves Peach Springs to the north along Peach Springs Canyon and goes all the way to the river's edge. This is unpaved but quite well traveled since it used by the Hualapai to launch raft trips down the Colorado. 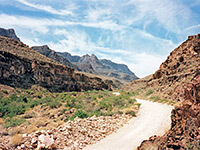 The third is the Buck and Doe Road (IR 1) - paved for a while then good quality gravel, this goes northwest close to the reservation boundary for over 50 miles to Grand Canyon West and the Skywalk, from where another unpaved route continues further west and meets the Pearce Ferry Road. Buck and Doe and its side roads offer the easiest access to the backcountry, with many lonely canyons within one day's hike, such as Bridge, Hindu, Meriwhitica and Milkweed. A permit must be purchased for all trips off paved roads in the Hualapai Reservation, and the cost was increased recently to $30 per day for day trips or around $40 for camping. They are available in the center of Peach Springs at the Hualapai Lodge, which also has information about raft trips and guided tours.